The Ridgid 18V Impact Driver is powered by Hyper-Lithium battery technology, and offers 1,750 inch lbs. of torque for the most demanding applications. Featuring an innovative quick load bit holder, bit changes are quick and easy with a snap load collet and simple ejecting bit release. And the exclusive Grip Light technology engages the LED light by simply holding the tool to increase visibility and make the job easier. The DEWALT 20V MAX Lithium-Ion 1/2-inch Cordless Impact Wrench Kit is ideal for driving and removing fasteners in wood, metal or concrete. This wrench features a durable magnesium gear case and all metal transmission for extended durability, and comes backed by a three year limited warranty for added peace of mind. The DEWALT DCF883M2 20V MAX* Lithium Ion 3/8-inch Impact Wrench Kit features a compact, lightweight (3. 4 lbs) design that fits into tight areas. It has three LED lights with 20 second delay after trigger release, that helps to provide visibility without shadows. Also features a hog ring anvil to easily change sockets. The textured anti-slip comfort grip provides maximum comfort and control for the user. 18V Impact Driver The Ridgid 18V Impact Driver is powered by Hyper-Lithium battery technology, and offers 1,750 inch lbs. of torque for the most demanding applications. Featuring an innovative quick load bit holder, bit changes are quick and easy with a snap load collet and simple ejecting bit release. And the exclusive Grip Light technology engages the LED light by simply holding the tool to increase visibility and make the job easier. 18V Impact Driver is rated 4.4 out of 5 by 12. Rated 1 out of 5 by cheesedeer from Broken after one use Bought it as part of a larger kit. First bit I put in it jammed. Broke the chuck trying to get it out. Didn't use it until well after a year of purchase so I assume the warranty has run out. At least the radio and drill still work. Rated 5 out of 5 by Rebelbuck from Great tool The warranty is the best on the market with free parts, service, and batteries for life. Rated 5 out of 5 by Disappointed from Great impact drill. Can even remove the lugs from my Chevy This impact drill has quickly become one of my favorite tools. I can't think of anything that I would suggest to Rigid to improve it. It has lived up to my expections everytime I've used it. So nice not to have to drag an air hose around anymore to run my pneumatic impact. Rated 4 out of 5 by Biscuit from Great tool at a great price The new style batteries on these tools are a cut above. Short term charging, long term use. Plenty of torque with a light. This tool has it all. Rated 5 out of 5 by Howie from Good product This is my first impact tool. Wish I had purchased it years ago. The warranty was an important factor in my purchase. Rated 5 out of 5 by allan from AMAZING TOOL! A total powerhouse at A great price. No let downs here, Enough said! Rated 5 out of 5 by boog from very good I like the impact drill wish it came with two batteries ,I know it would have cost more .The power it has is very good I don't pre drill holes for long screws. What type of battery does this come with? The item description doesn't specify what type of battery this driver uses. Could you save me a trip to the store? AC840085 18V Hyper&trade; Lithium Compact Battery. Standard Three year warranty on the battery. In addition if you buy a Ridgid tool through Home depot you can register on Ridgids website for a free Lifetime Service Agreement (LSA) which covers tool and battery/charger. Yes! You read that correctly.. once registered if the battery fails they will replace it. If the tool wears out they will replace it free of charge as long as you are the original owner. It's a no brainer! 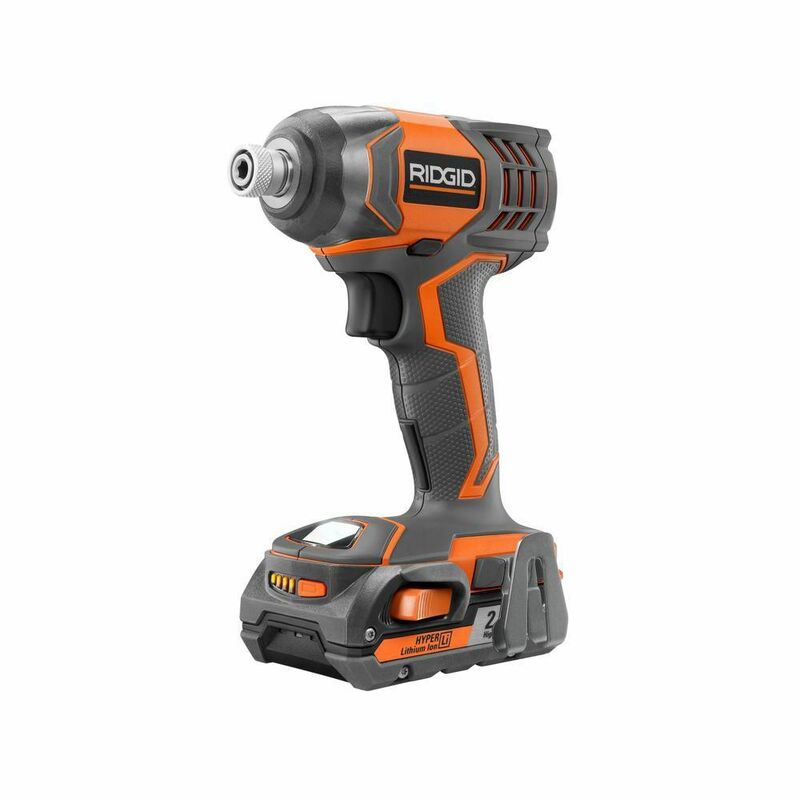 Hi, will the battery from this impact driver fit my 10 year old 18v Ridgid drill?